Make the gift of memories! This year, offer your child THE BIRTHDAY PARTY that he and his friends will talk about for years. 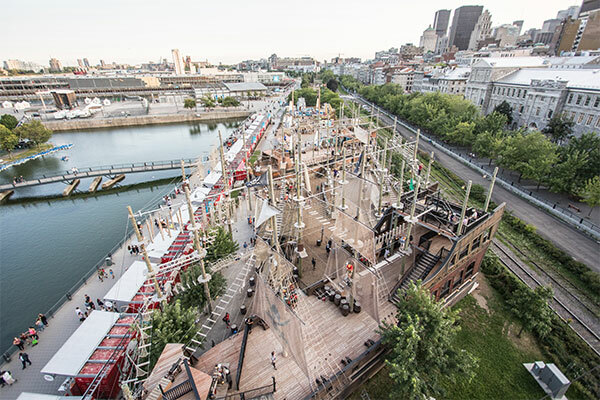 Celebrate his birthday in a unique location with a priviledged access to all the activities at Voiles en Voiles. 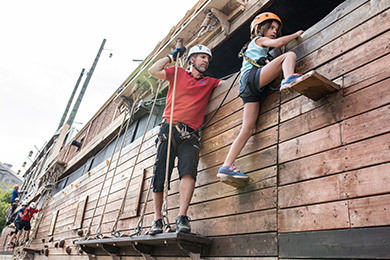 With its courses of different difficulty levels and different heights, and with its various activities, Voiles en Voiles will please all your group ... from the parents to the youngest child. 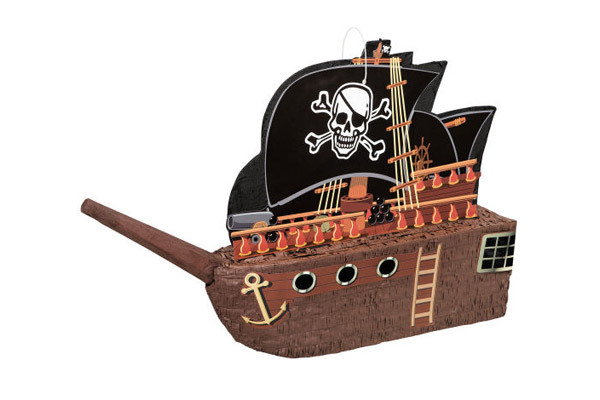 Enter our universe filled with 18th century old pirates’ ships and Royal Navy ships ! 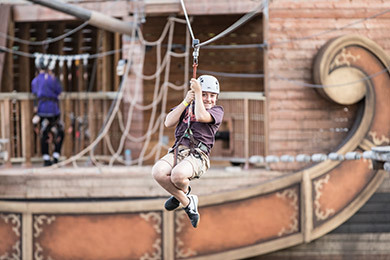 All our packages include 2 or 4 hours of unlimited access to all the activities offered at Voiles en Voiles. 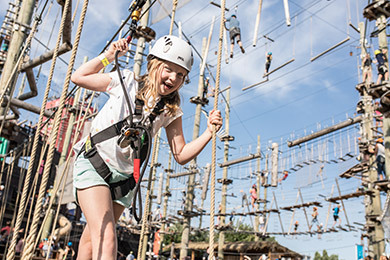 Participants can stay in the aerial courses for the complete length of the activity, or share their time between the various activities that Voiles en Voiles has to offer. No worries but only memories! Contact us! 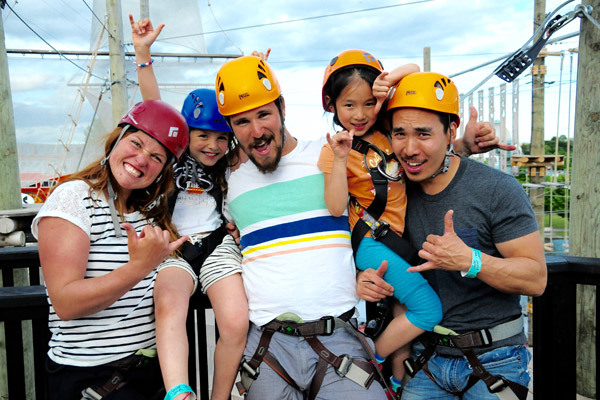 With the birthday party package, we will reserve a private spot with a table for you and your group, right under the aerial courses. It is the perfect setup to share a small lunch or serve a birthday cake. 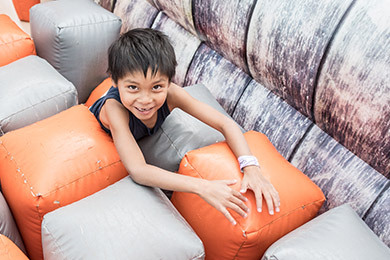 The birthday party package is designed for a maximum of 8 participants. For example, it can be all children, or it could also be 6 children with 2 parents. We limited it to 8 participants because with time, we realized it is the approximate number of friends that children invite to their birthday party ! If all the parents want to come and watch, they can access the site for free and watch their children from below. Also, since Voiles en Voiles is an open site, we ask you to plan some parental supervision as there are 3 distinct entrances to the park. Access to a table under the courses, for a duration of 1 hour. 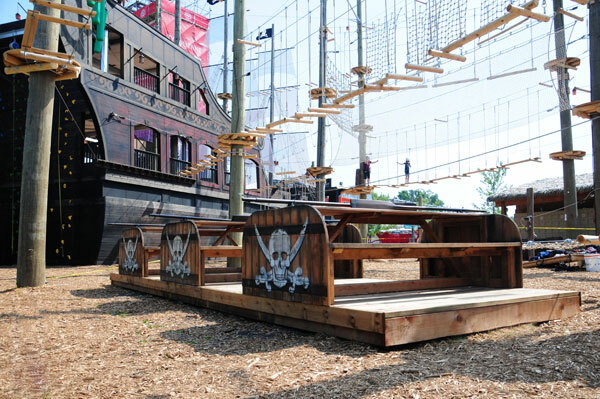 We reserve the table for you and your guests after the activities. It is the perfect time to get together, share a small lunch or a cake and open gifts ! NEW FOR 2017 ! The Treasure chest opening ceremony ! The guest of honor will have the chance to open the chest, and pick his gift ! 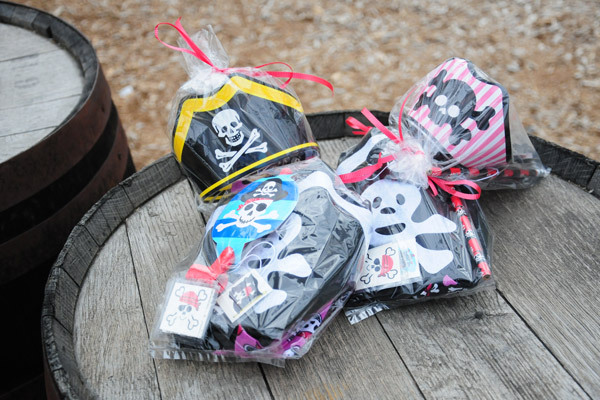 His or her friends will also receive a small gift from the chest ! We also include all that is necessary for the cake eating part. (small plates, forks, napkins…). However, if you plan on having a complete lunch, we ask you to bring your own tableware. We also have a refrigerator that you can use to store your cake or snacks during the activities. Add a candy filled piñata to your birthday party, it will help the kids remember this day as an extra special one ! Add to your reservation a delicious pirate’s themed cake made especially for you. Different flavours available. To confirm a reservation, we ask for a 50% deposit, that can be paid online. The remaining amount is to be paid the day of the activity, when all the participants have arrived. 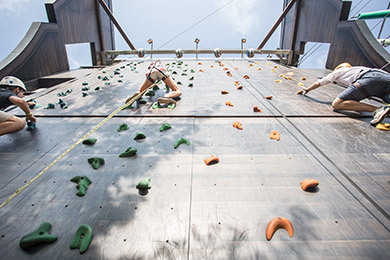 We ask for a minimum of 2 parents present on the day of the activity, to supervise the group. Taxes are not included. Prices can change without notice. Is there a party entertainer included in the reservation ? No. Our staff will offer you a special welcome and take good care of you, but we don’t have a party entertainer assigned to your group. 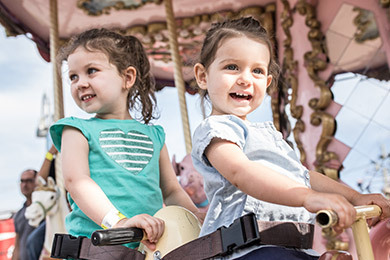 Since during most of the 2 or 4 hours the children are in the different courses and activities, we feel that a party entertainer is really not a need. Is there a cake included in the price ? No, there isn’t food or a cake included in the reservation. If you want to bring your own cake, and your own lunch, feel free to do so. We have a refrigerator and a freezer to keep your food at a good temperature. 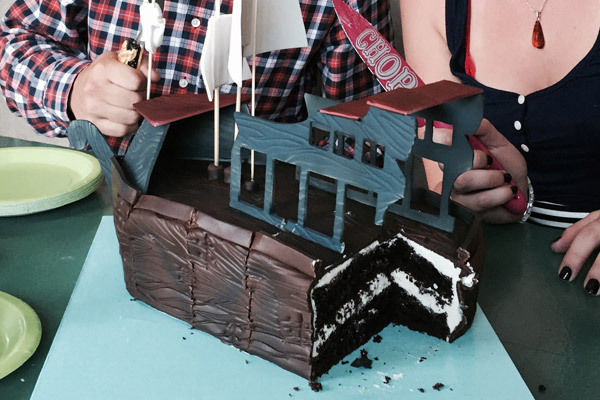 If you want to add a cake or a piñata to your reservation, contact us to know our rates. 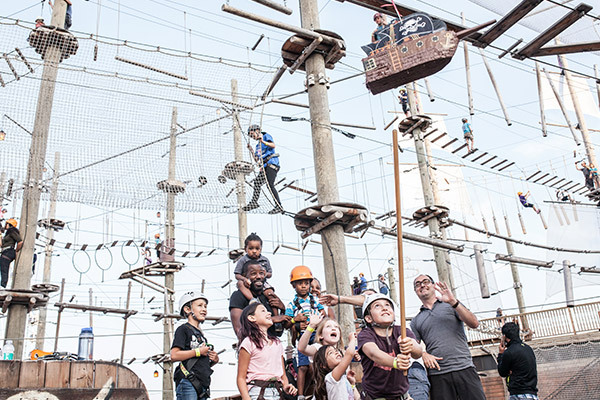 Where can the parents go while the children are in the activities ? We have a lounge area with Adirondack chairs and picnic tables where parents can go relax, talk and keep an eye on the kids while they are having fun ! How to get to Voiles en Voiles ? Voiles en Voiles is located in the Old Port of Montreal, on the Place des Vestiges. The closest parking is at the Clock tower dock, and the closest metro is Champ-de-Mars. 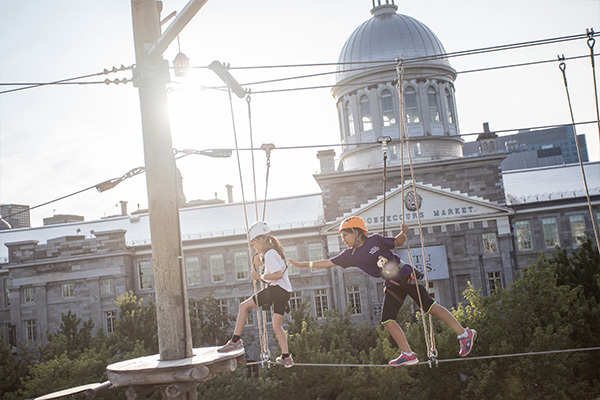 We suggest that you access Voiles en Voiles by the entrance that is located on the Clock tower dock, that is right next to the Mtl Zipline tower : you can’t miss it !